Creative drivers at the top of their game have a creative philosophy. Its a code they live by when theyre working on a movie set, performing in the studio or rehearsing for a new project. Its also a way of doing business that sets them apart from other talented people. 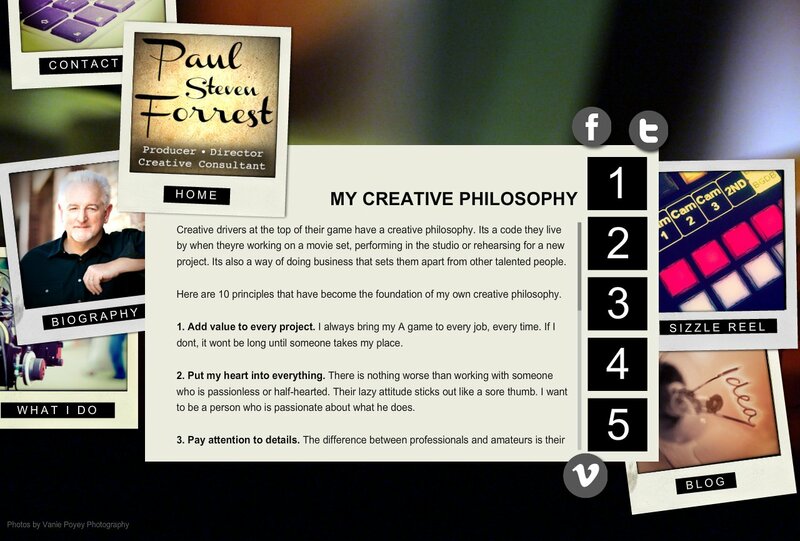 Here are 10 principles that have become the foundation of my own creative philosophy. 1. Add value to every project. I always bring my A game to every job, every time. If I dont, it wont be long until someone takes my place. 2. Put my heart into everything. There is nothing worse than working with someone who is passionless or half-hearted. Their lazy attitude sticks out like a sore thumb. I want to be a person who is passionate about what he does. 3. Pay attention to details. The difference between professionals and amateurs is their attention to detail. I always take the extra time to be a professional. 4. Be a man of integrity. Even if it costs me money, honesty and truthfulness with the crew, and the client, is always best. My reputation is on the line every single day. 5. Over deliver. Giving a client more than is expected says a lot about work ethic. Repeat business usually follows people who do more than they promise. 6. Be honest in my communication. Don't be afraid to say, I don't know, but I'll find out! 7. Serve the clients needs. My job is to bring my clients vision to life, not mine. My talent and experience enable me to do that. 8. Take personal responsibility. If I make a mistake, I apologize and try not to make it again. Taking ownership shows maturity. 9. Have fun and stay positive. Theres no better experience than working with talented, competent professionals who make the job fun! A positive, can-do attitude goes a long way. And clients want to come back again. 10. Raise the bar. Anyone can be mediocre work but true professionals strive for excellence. I always try to make my work amazing.